The Genealogical Research Institute of Pittsburgh (GRIP) early bird deadline is May 15th, after which regular tuition pricing will be in effect. 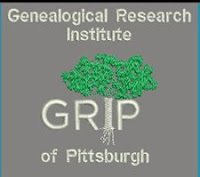 For a detailed class schedule for each of the six courses offered at GRIP July 22-26, 2013 click on the course title link at http://www.gripitt.org/?page_id=547. There are still dorm rooms available for those interested in staying on campus. I am excited to attend GRIP this year and lecture in the Advanced Land Research: Locating, Analyzing, Mapping course. I hope to see many of you there! I appreciate all the interest there has been in the Gen Proof groups studying the new book Mastering Genealogical Proof by Thomas W. Jones. [See the announcement and details on these new study groups here. Order the book here.] There are over 100 members on the Mastering Genealogical Proof Google + Community page. We have decided to create a waiting list to join the study groups so that registration for each of the study groups will be very orderly. 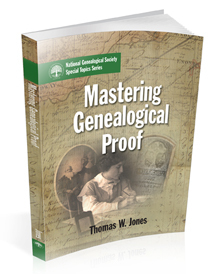 1) Read Mastering Genealogical Proof and complete all of the practice exercises. 2) Commit to discussing each chapter with your group members and mentor. For groups that meet at a designated time each week this would mean attending ALL the discussions for eight weeks (or every other week for 16 weeks). If you are traveling, have major commitments this summer, or do not have at least five hours per week to dedicate to studying Mastering Genealogical Proof, then please wait until you have the time to sign up to participate. Each of the mentors that will study in the first group with Tom Jones is evaluating their schedule and deciding upon a study group format and start date for their group. A list of the Gen Proof mentors will be posted in May. As the format and time are the choice of the mentor there will be some variety in the options available. Ongoing discussions boards sharing questions and thoughts via a private Google + community page. Participants can post thoughts and questions on an ongoing basis on the chapter being studied during week and the mentor and group members will posts their thoughts and responses. Those on the waiting list will be able to choose a study group time and format that works best for them on a first come first serve basis. There is only room for ten people in each group, so if all the groups fill quickly then more groups will be scheduled in the fall. 2) We will email an application form to those on the waiting list which will include the name of each mentor with their study group start date and format. Participants will reply with a commitment to participate and indicate their first and second choice for study groups. 3) Once we have those on the waiting list divided into study groups your mentor will contact you and give you access to the private Google + community or Basecamp website where you will participate in your group discussions. 4) Have fun studying this wonderful new book with a great group of genealogists! If you would like to study the book Mastering Genealogical Proof, but do not want to participate in the in-depth small group discussions in this Gen Proof study program, then you may like to follow along with others studying the book in Dear Myrtle’s MPG Study Group by watching a panel discuss each chapter via Google Hangouts on Air or YouTube. The National Genealogical Society has a new addition to its Research in the States series. This one focuses on New York City and the surrounding areas and is written by New York research expert Laura Murphy DeGrazia. I have enjoyed Laura's presentations at national conferences and am excited to see this new research guide. The NGS Research in the States books are useful to learn about the records, repositories and resources for genealogical research in a specific state or area. They can be purchased in paperback or electronic formats. There are currently research guides available for eighteen states, with more to come in the future. Arlington, VA, 29 April 2013: The National Genealogical Society announces the release of the newest edition in its Research in the States series: Research in New York City, Long Island, and Westchester County. This publication was written by native New Yorker and nationally recognized genealogist Laura Murphy DeGrazia, cg, fgbs. Laura is a trustee and former president of BCG and co-editor of the NYG&B Record. Barbara Vines Little, cg, fngs, fvgs, is a former NGS president and is the current editor of the NGS Research in the States series and the Magazine of Virginia Genealogy. The guide will be available for sale at the NGS 2013 Family History Conference in Las Vegas from 8–11 May in the NGS booth (#205). Author Laura Murphy DeGrazia will be available for book signings at the NGS conference booth on Thursday, 9 May from 9:00 a.m.–10:50 a.m.
Research in New York City, Long Island, and Westchester County will be available in the NGS store at http://www.ngsgenealogy.org/cs/research_in_the_states in a PDF and print version beginning 8 May; the print version will ship after 20 May. Other titles in the Research in the States series, which are also available in PDF and print form, include Arkansas, Colorado, Georgia, Illinois, Indiana, Kentucky, Maryland, Michigan, Missouri, New Jersey, North Carolina, Ohio, Oregon, Pennsylvania, South Carolina, Tennessee, Virginia, and West Virginia. Additional states and a full New York State guide are planned for the future. I am excited to introduce "Gen Proof," a new group studying the book Mastering Genealogical Proof by Thomas W. Jones, PhD, GG, CGL, FASG, FNGS. This book is published by the National Genealogical Society (NGS) and can be ordered here. I have worked with Thomas W. Jones to organize the study program and provide an opportunity for individuals to discuss the material in each chapter. We are very fortunate to have Tom Jones mentoring the first Gen Proof study group, and the participants in that group will turn around and mentor future groups. The first group will begin on May 19th and the subsequent groups will begin this summer. Watch for more details coming soon. We will be using Google + private communities as a platform for these study groups so that there will be no expense involved to participate. You will need to have a free Google + account. Once organized each Gen Proof study group will have their own private Google + community where they can ask and answer questions anddiscuss the book content and assignments. The groups will meet in one of three formats selected by the mentor. 1) Some of the groups will meet in video chat discussions via Google Hangouts and will require headsets and microphones along with a camera on a computer or tablet. This is a fun way to interact with other study group members. 2) Other groups will discuss the book in asychronous (ongoing) discussions on the board in the Google + private community. Participants will not need to be online at the same time every week, but will carry on a conversation on each chapter of the book throughout the week. 3) A few of the groups will meet in private online text chats via Basecamp or Campfire. These groups will meet either once a week, or every other week to discuss a chapter of the book with their mentor. If you are interested in participating in a Gen Proof study group then please send an email to genproofstudy at gmail.com to be added to the waiting list. Those on the waiting list will be contacted in the order they applied to join and be invited to select one of the study groups to join. To join this community just click the red “Join Community” button at the top of the page. Everyone is invited to join this community page and begin discussing the book. It is fairly simple to use so log on and give it a try. There is a category on the left side of the page for each chapter of the book. Please post comments and questions in the category for the correct chapter. These two study group options will provide an opportunity for many people to participate, and individuals can choose the study format that will work best for them. I have written previously about the Forensic Genealogy Institute, as well as other genealogy institutes, here. Valerie Elkins has also posted on her Family Cherished blog about the Forensic Genealogy Institute. You may find her insights valuable as well. If you missed the Professional Management Conference (PMC) put on the by the Association of Professional Genealogists, or if you attended the conference virtually and would now like a copy of the syllabus, electronic PDF files of the syllabus are now available for purchase. I attended the conference virtually and would have loved to have been there in person for the workshops that were not broadcast online. I have purchased the PMC syllabus for the last few years as part of my continuing education. 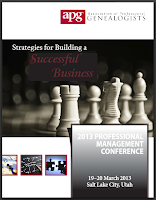 The syllabus from the 2013 APG Professional Management Conference (PMC) held 19-20 March 2013 in Salt Lake City is available for sale. Go to http://www.apgen.org/catalog/products.html to place your order. The syllabus is $15 and will be delivered in electronic format (PDF). NGS Mobile App is ready for download! Get the most from your NGS 2013 Family History Conference experience by downloading our new and improved mobile app. Use the NGS app to help you make the most of your trip to Las Vegas before, during and after the conference. 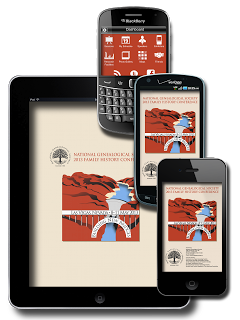 The NGS 2013 Family History Conference app is completely free! Improve your conference experience by taking the schedule, maps, Twitter, and more with you on your phone or other mobile device. The app is available for iOS, Android, Blackberry, Windows Phone, and web-enabled devices. As part of my continuing series where guest authors share reviews of courses at genealogy institutes, here Ann G. Lawthers writes about one of the courses at the British Institute which is sponsored by the International Society for British Genealogy and Family History. Do you have an Irish brick wall? Or do you merely have ancestors from Ireland you wish to know more about? David Rencher’s course “Advanced Methodology for Irish Research” at the week-long British Institute helps you scale the walls and follow the trail of breadcrumbs left by your ancestors. The course principally builds research skills, but also introduces the student to the rich array of Irish resources available at the Salt Lake Family History Library. Many of the FHL resources can be ordered and sent to your local Family History Center. Since Irish records suffered a devastating blow with the demolition of the Public Records Office in 1922, the tools, skills, and strategies learned researching one’s Irish ancestors also apply to researching an ancestor from a burned county in the US. Students begin by learning to thoroughly mine what they know about ancestors on this side of the pond for clues about the people left behind in Ireland. Next, transferring the focus to Ireland, students learn to evaluate and use pre-20th century lists of names, such as Griffiths Valuation, for clues about ancestors. And location, location, location. A wealth of resources about Irish places and institutions awaits you at the Family History Library: the Parliamentary Gazetteer, Ordnance Survey maps, county histories and more. For those with ancestors from Northern Ireland, the course spends a day introducing the student to the special problems of Scots-Irish research. I would highly recommend any of David Rencher’s Irish courses. He is an engaging presenter and thoroughly knowledgeable about the subject. You will learn research techniques that help you not only with your Irish research but can be used for other family lines as well. You will find yourself regularly referring to the excellently organized syllabus when you return home to remind yourself of specific strategies. To top it off, being in Salt Lake for the course and having the resources of the Family History Library at your fingertips, makes for a priceless experience. Ann G. Lawthers researches her Irish, German, French-Canadian and English ancestors from her home in Massachusetts. She has completed the BU Certificate course, the BU writing course, as well as the 2012 British Institute course, “Advanced Methodology for Irish Research.” Ann juggles a full-time job, various volunteer posts, participation in ProGen 15, as well as the siren call of her family’s history, but hopes to achieve Certified Genealogist status one day. I received the following announcement from the ISBGFH regarding the British Institute. 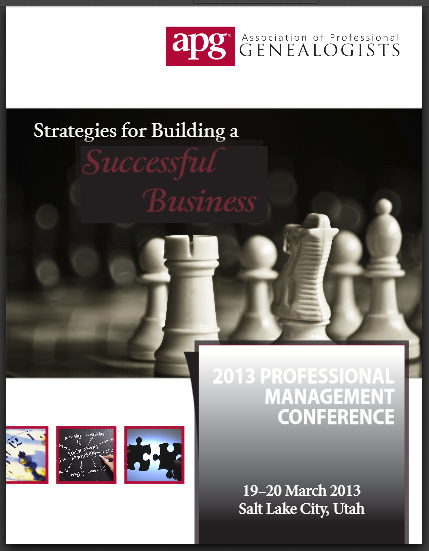 Note that registration opens on April 8, 2013. Class size is limited and some courses may fill quickly. WESTMINSTER, Colo., 3 April 2013—The International Society for British Genealogy and Family History announces the courses for the 13th annual British Institute, to be held 7–11 October in Salt Lake City at the Radisson Downtown, located two blocks from the Family History Library. Registration will open 9:00 a.m. Pacific daylight time on 8 April 2013 and class size is limited. “The opportunity to be taught by the best teachers in the presence of the largest genealogy library was a dream come true!” said Paul Hawthorne, 2012 attendee. From Simple to Complex: Applying Genealogy’s Standard of Acceptability to British Research – Thomas W. Jones, Ph.D., CG, CGL, FASG, FUGA, FNGS Through hands-on activities, lectures, and discussions, participants will learn how to use widely accepted standards to measure their genealogical work’s accuracy and to assess others’ genealogical conclusions. In the process they also will learn about genealogical research planning, its implementation, genealogical reasoning, and the preparation of credible genealogical products. David E. Rencher, AG, CG, FIGRS, FUGA This course is designed to address Irish genealogical research for both the landed and landless families in Ireland. When land records are meager, there are still methods to research the landless in the land records and the associated record fragments created from land use. Assembling this meager evidence provides the clearest picture possible for an Irish family in the 17th to 20th centuries. Concentrating on tracing pre-1850 English ancestors, this course will interest those whose ancestors emigrated to North America before English civil registration in 1837, or those who have traced their ancestors back to the early 1800s. For each record category, examples of original documents will be used to guide you through interpretation, locating, and lastly, how to access through the Internet, the Family History Library, and other available resources. This course will provide an introduction to “The Cloud” and how to use it to one’s research advantage. Learn how to choose the right combination of computing devices to enhance any family history research trip. The Cloud allows moving data seamlessly between devices and the ability to share with family and other researchers.